"Like any bride-to-be Charlotte Buckley was determined to look her best on her wedding day. But her determination to lose weight to fit into a size 10 bridal gown turned into an anorexic obsession that almost killed her. After losing four stones in just over a year her parents eventually begged her to seek help and she had to spend six months recovering in hospital. Charlotte Buckley's determination to get into her size ten wedding dress left her painfully thin with an eating disorder. The 22-year-old says the ordeal contributed to the failure of her marriage and the couple are now filing for divorce. Miss Buckley is one of a growing number of girls who develop what has been named "brideorexia" - an obsessive desire to lose weight for their wedding day. Yesterday the sales representative said: "Like so many women I wanted to slim down for my big day. "I knew I was pushing myself, but as each pound slid off it became like a drug, with compliments on my wedding day being the final reward. "My wedding day really was the happiest day of my life but not for reasons you'd expect. "The fact that I was marrying the man of my dreams paled in comparison to the joy I felt as a tiny size eight." Miss Buckley, from Lancaster, met her fiance Dan Broadley, 26, on a night out in February 2004, and was delighted when he proposed the next April. 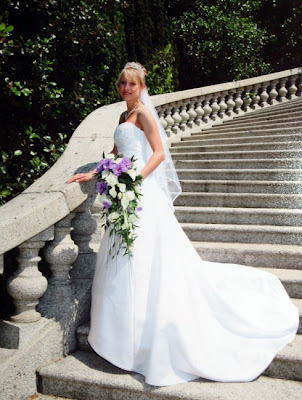 But things began to go wrong in March 2006, four months before the wedding when Miss Buckley, then a healthy 9st 7lb, bought a bridal gown two sizes too small to encourage herself to diet for the big day. "I devised my own panic diet that involved eating three tablespoons of muesli for breakfast, two crispbreads and an apple for lunch and a chocolate bar for dinner," she said. "Losing weight became an obsession as I limited myself to 500 calories a day." By her wedding day her hip bones and rib cage jutted out and her dress was now too big and had to be pinned into place. But her strict diet did not stop for her honeymoon in the Maldives or subsequent married life, and neither did the worrying weight loss. "I became even more focused on shrinking, terrified I'd get fat without a goal to focus on," she said. She visited pro-anorexia websites, where women encourage each other to starve, exchange diet tips, and post pictures of skinny celebrities. Only in March last year, when she weighed just 5st 9lb, did her parents Sally, 48, and Les, 54, finally persuade her to seek help. But after six months recovering in the eating disorder unit at Cheadle Royal Hospital, Stockport, her marriage was over. Miss Buckley said: "I now weigh 8st and am truly happy with the way I look." Emma Healey, director of operations at eating disorder charity beat, said "brideorexia" was a worrying trend among young women. "Getting married is one of the most stressful events in a woman's life and it is possible that some respond to that pressure by taking control of their life through their eating," she said. "We all know about the pressures on young women to look beautiful and some will push themselves to extremes to wear that wedding dress and look their best." Many thanks to wackytobeme for sending me the link to this story. Medusa, I know this post isn't about Kimkims, but while reading this post the mention of 500 calories a day really jumped out at me. I got that sick, sinking feeling at yet another confirmation that I was definitely following an anorexic WOE while on Kimkins. I hope Kimkins members and others who are restricting their food intake to dangerous levels are paying attention and save themselves. The quest to be thinner is not worth ruining your health and negatively altering your life in the process. A healthy weight can be achieved in a healthy way. Risking your health while flirting with an eating disorder is not progress, it's not an achievement. It's a dangerous path with often deadly consequences. Thanks for another great post and for all you do to bring awareness to us all about the dangers of eating disorders. Pretty sad how her husband didn't stick around for her. What about those wedding vows -- "in sickness or in health"? Guess they didn't mean much to this guy. It just goes to show that it's not you fit into the dress (or tux, for that matter) that counts, it's the character of the one you marry. And that goes for men and women. Quoted for truth. Great comments, Genre Geek. Thanks. Holly, first of all, congratulations on your upcoming marriage! I'm so proud of you that you are not going to diet to fit into a smaller-size dress. Again, congrats to both you and your fiance! Charlotte looks so good now that she's healthy again! Girls should never fall victim to this disorder. It's a shame that there aren't enough people to tell them how pretty they are. Anorexia is just hell on Earth. I'm thrilled to hear you are doing so well. Congratulations on your five-year milestone! Your recovery has inspired many to seek help. Sincerest congratulations and best wishes to you.